When we first had a chance to drive the Nexon AMT, we came back quite pleased with how it transformed the petrol engine and added convenience to the city manners of the diesel. Since then we have also driven the excellently tuned Maruti Brezza AMT. So it’s the perfect time to test how this additional perspective will colour our impressions of the Nexon diesel XZA+ AMT. When Tata added on the new AMT 6-speed gearbox to both the top-end models in the Nexon petrol and diesel lineups, they made no other changes to the features or spec sheet whatsoever. So this review focuses on how the Nexon diesel automatic drives and performs in the real world. 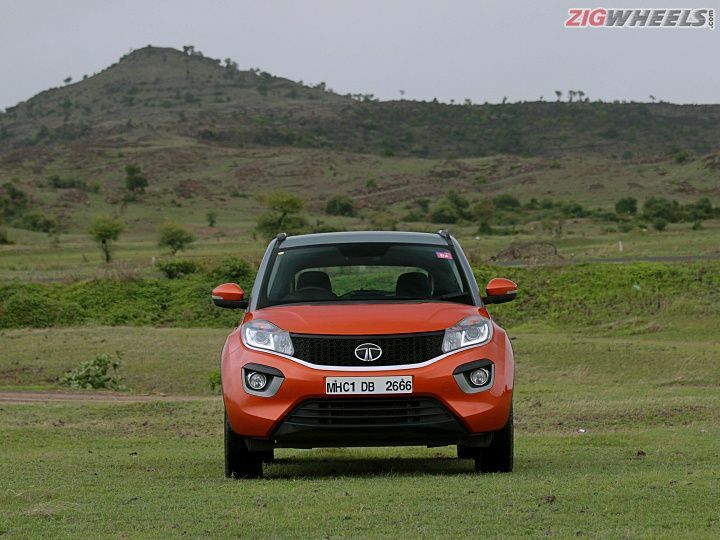 For a full review of the Tata Nexon, check out our full road test review here. And for a comparison with the Maruti Suzuki Vitara Brezza here. Tata’s IMPACT design, a year on from its launch, is still quite the head turner and its distinct look hasn't yet started to age. In fact, it looks stunning in this orange and grey dual-tone colour scheme which also sees the shoulder sash featuring the same grey shade as the roof as compared to the contrasting pearl white option. The interiors are a real delight in the Nexon. Save for a few rough edges, the cabin feels very well made. No soft-touch plastics here, but the buttons and controls feel good to use. The only oddball is the 6.5-inch touchscreen that is slightly sub-par in functionality compared to the competition but still offers Android Auto and Apple CarPlay. Overall, though, you really do feel like the interiors are from a segment above. Final mention has to be for that excellent 8-speaker Harman audio system that had us audiophiles fighting for the keys to the Tata whenever they were up for grabs. The Nexon diesel is powered by a 1.5-litre motor that makes 110PS and 260Nm which is sent to the front wheels via a 6-speed AMT gearbox. There are also three drive modes - City, Sport and Eco. These change the throttle response and make a perceivable difference to how this crossover drives. Ride is quite comfortable over most road conditions with a little body roll evident when pushed through a set of corners. What’s really nice is the predictable nature in which the Nexon handles the said set of corners with excellent grip from the stock Goodyear tyres. The new AMT is nicely tuned to make the most of the smooth torque of the Revotorq engine. At city speeds, the shifts are fairly inconspicuous. With the wide spread of power, the gearbox is not constantly searching for the right gear. The shifts themselves are quite quick, but the downside to this is that under acceleration the head nod experienced is a little more pronounced. In our experience, a slightly slower shifting gearbox tends to be smoother when under the load of heavy acceleration which is the case with the Maruti Vitara Brezza AMT for example. In different drive modes, in addition to the change in throttle response, the gearbox shift logic changes as well. In Eco mode, the softer throttle response is accompanied by early shifts, while in ‘City’ the gearbox is happy to hold on to gears a little longer. This ability to alter the throttle response with the drive modes means that you can adjust the way the Nexon AMT drives to find a combination that best suits your driving style. This is not quite the case with other AMTs where you have to learn to adapt your driving style to the gearbox instead. We found that we defaulted to ‘City’ mode on most occasions as it offered the best comfort and driving pleasure for our driving style. You can also shift the gear into manual mode, but this also defaults the engine mode to Sport mode. While this is great for driving on the highway or the ghats, where you want more control over the gearbox, it gets quite annoying in the city. This is because the enhanced throttle response of Sport mode makes it much harder to drive smoothly at slower speeds as small prods on the throttle tend to result in a significant head nod in first gear. As we have found with most AMTs, the Nexon XZA+ is also a little behind the curve of the manual variant in performance. The sprint to 100kmph is completed in a relaxed 16.62 seconds, nearly three seconds slower than the manual-equipped diesel. The fuel efficiency, on the upside, isn’t compromised by much though. In Eco mode, the best mileage we could manage was 17.13kmpl in the city which is about 1kmpl better than the manual and 23.60kmpl on the highway which is just slightly short of the mileage of the manual. The Nexon AMT is available in two trim levels - the lower-spec XMA (Rs 8.61 lakh) and the top-of-the-line XZA+ dual-tone (Rs 10.67 lakh). Both offer nothing more than the convenience of the AMT transmission over their manual counterparts. In numbers that relates to a premium of Rs 70,000 for the XMA and Rs 71,000 for the XZA+ over their manual counterparts. In the petrols the price difference between the manual and automatics is Rs 60,000 and Rs 61,000 for the two petrol trims. The Nexon AMT is a good compromise between the convenience of an automatic and the crudeness of an AMT. The shifts are smooth and quick at city speeds as well as while cruising, but tend to get a little jerky under acceleration. The best part is that in real-world conditions, the mileage is not too far off from the manual’s figures. That said, it’s not the best AMT out there and from our experience with both, we can say that the Maruti Suzuki Vitara Brezza AMT (Rs 10.55 lakh for the ZDi Plus dual-tone) gives you a much smoother driving experience. So finally, if the convenience of the AMT ranks high up among your priorities, we’d recommend you to take a test drive of the Vitara Brezza AMT before making your decision. If you appreciate the Nexon for the feature packed, great compact SUV that it is and spend a lot of time stuck in traffic, then the Tata Nexon AMT may be a worthwhile option.